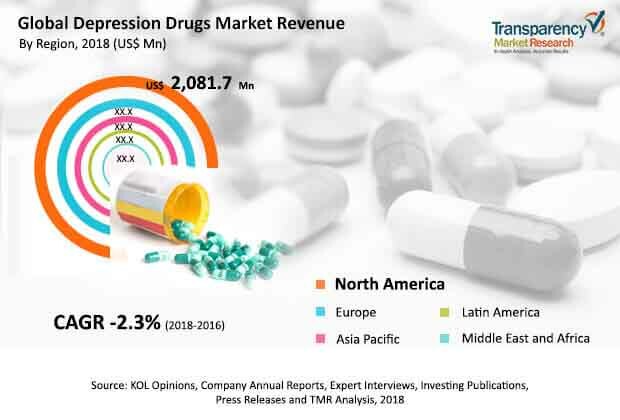 Transparency Market Research (TMR) has published a new report titled, “Depression Drugs Market - Global Industry Analysis, Size, Share, Growth, Trends, and Forecast, 2018–2026”. According to the report, the global depression drugs market was valued at US$ 6,500 Mn in 2017 and is anticipated to decline at a CAGR of 2% from 2018 to 2026. The report suggests that rise in incidence of major depression disorders is projected to drive demand for depression drugs from 2018 to 2026. Key players introduce their new depression drugs in developed regions such as Western Europe and North America. Hence, these regions are likely to account for significant share of the global depression drugs market. Rise in burden of schizophrenia and bipolar I disorder in emerging markets such as China and India is likely to boost the growth of the market in Asia Pacific during the forecast period. Depression is an indication where a patient feels down in the dumps, miserable, unhappy, blue, or sad. For short period of time, many people may feel this way at a time or another. True clinical depression is when a patient feels frustrated, angry, lost, and sad on a daily basis for a long period of time. Increase in prevalence of major depression disorders is projected to drive the market during the forecast period. According to the National Institute of Mental Health (NIMH), the U.S. adult population of approximately 10.3 million had at least one major depressive disorder episode with huge impairment. The population accounts for 4.3% of all adults in the country. Higher prevalence was observed among female adults at 8.5% as compared to 4.8% among male adults. The highest prevalence of major depression disorder episode was observed among people aged 18 to 25 at 10.9%. The global depression drugs market has been segmented based on drug class, disease type, distribution channel, and region. In terms of drug class, the market has been categorized into atypical antipsychotics, serotonin-norepinephrine reuptake inhibitor, selective serotonin reuptake inhibitor, central nervous system (CNS) stimulant, and others. The atypical antipsychotics segment leads the market and is expected to continue its dominance during the forecast period, followed by serotonin-norepinephrine reuptake inhibitor. High market share of the atypical antipsychotics segment is attributed to the launch of drugs in developed countries such as the U.S. and Canada. Based on disease type, the global depression drugs market has been classified into major depressive disorders, schizophrenia and bipolar I disorder, selective serotonin reuptake inhibitor induced, and others. Based on distribution channel, the global depression drugs market has been segmented into online pharmacies, hospital pharmacies, and retail pharmacies. The retail pharmacies segment held significant market share in 2017, and is anticipated to dominate the market during the forecast period. This large market share is attributed to rise in prevalence of major depression disorders across the world and increase in preference of depressed patients to purchase from retail pharmacies. However, the hospital pharmacies and retail pharmacies segments are anticipated to lose market share during the forecast period owing to exclusivity expiry of depression drugs. North America captured large share of the global depression drugs market in 2017. The region is home to several key players in the global depression drugs market. Hence, the region is likely to dominate the global market during the forecast period. Europe held the second largest share of the global depression drugs market in 2017. Increase in research and development on depression drugs is attributed to high market share of the region. The market in Middle East & Africa is anticipated to expand at the fastest growth rate during the forecast period. Increase in government initiatives in health care sector is projected to fuel the growth of the market in the region. Initiatives by local governments to attain self-sufficiency in manufacturing depression drugs is likely to boost market growth in Asia Pacific and Latin America. Key players operating in the global depression drugs market and profiled in the report include Otsuka Pharmaceutical Co., Ltd., Eli Lilly and Company, Pfizer, Inc., AstraZeneca, Allergan USA, Inc., Novartis AG, GlaxoSmithKline, Takeda Pharmaceutical Company Ltd, Sebela Pharmaceutical, Inc., and Johnson & Johnson. These players adopt inorganic and organic growth strategies to increase drug offerings, strengthen reach across the world, garner market share, and increase customer base.